The vote for this one is FANTASTIC! 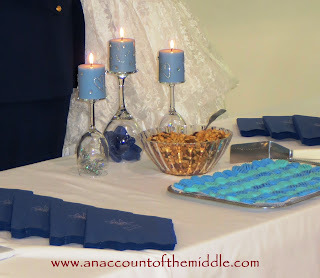 While planning the menu for a wedding I recently catered (more on that later) I ran across a pin for Cream Cheese Mints. They're relatively easy to make but they are somewhat time consuming. I made an experimental batch for a potluck at work, because we all know my coworkers make great guinea pigs. These mints got wonderful reviews, from EVERYONE! But the best thing about them? They can be made weeks ahead of time, frozen, and served from a frozen state. That's right, just yank them out of the freezer and throw them on a serving plate. So three weeks before the wedding we gathered up at M's house to do some major wedding food and decoration preparation. I made a total of four batches; two batches of Butter Mint in Wilton Sky Blue, and two batches of Almond in Wilton Royal Blue. You definitely need a mixer to make this recipe. I used a hand mixer the first time (and provided you're not using a geriatric mixer that's hanging on by it's last grey beater) it works fine. 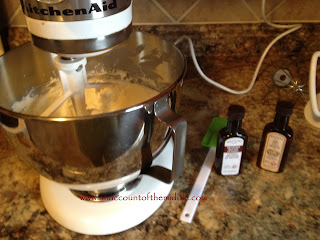 However, a Kitchen Aid mixer is great if you have it, and thankfully M did. Just use caution when turning it on after adding the powdered sugar or you might end up looking like something from the Victorian era. Don't worry to much about the mess though, by the time you're done the kitchen will look like it was the crime scene for a smurf mass murder anyway. I couldn't find a scoop small enough to make the balls so I just had to eyeball them. Four batches yielded approximately 600 mints total. That's a lot of little blue balls to roll in sugar and mash with a fork. I got good at it...really good at it. In fact, I was so good I could do it with my eyes closed (apparently). Since we planned to freeze them for later use I placed them on cookie sheets and popped them in the freezer for approximately 45 minutes. 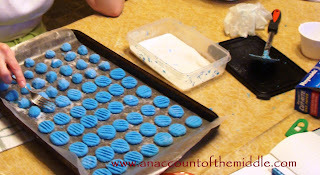 After that I stored them in large plastic containers with a piece of wax paper between each layer. I didn't have any trouble with them becoming smashed or sticking together. Notice what they're keeping company with? Yep, we made sausage balls too. Nine batches of sausage balls, that's approximately 700 balls for those of you that were wondering.